Trim Winder For Slitting Machine Video(FDS-V) - HCI Converting Equipment Co., Ltd.
We hope to find the agent with efficient sales organization to market HCI machinery cooperatively. If you are in the field of flexible package, please contact us. 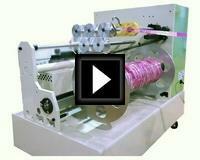 Designed to wind and collect the edge trim during slitting machine processes.